What's selling well in Japan these days? The likes of Meruru no Atelier: Arland no Renkinjutsushi 3, Steins;Gate and a new Gundam game for the PlayStation Portable. I know. Exciting, right? Well, maybe not to you. 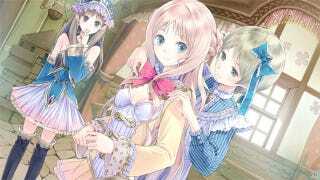 You might not know what the hell a Meruru no Atelier: Arland no Renkinjutsushi 3 is. It's the latest entry in Gust's alchemy-infused role-playing game series. We've had a couple escape Japan, like Mana Khemia: Alchemists of Al-Revis and Atelier Rorona: The Alchemist of Arland. They're a big deal in Japan, which is proven by the newest entry for the PlayStation 3 selling a cool 80,000 copies week one. Other notables in the top ten include a new Bleach game for the PS3, a Prince of Tennis game and lots of PSP fare. Maybe you can better relate to Mass Effect 2 and GTA IV: Complete Edition cracking the top 20? To see how they're gaming and spending Japan, read on for the latest Media Creates sales figures. On the hardware side, the Nintendo 3DS takes a back seat to the PSP this week, after enjoying a moment in the sun.